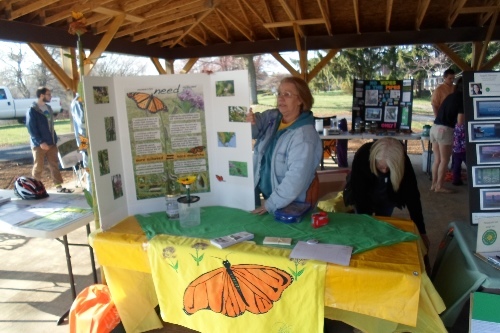 Gail Napora and her eye catching Monarch display at Harrisonburg’s Blacks Run CleanUp in April. Carefully prepared milkweed seeds ready for dissemination! 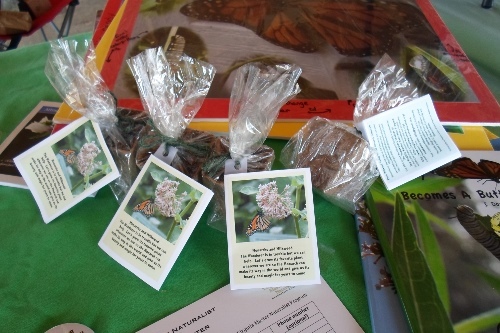 To that end, the Headwaters Chapter has been spreading the word on the plight of the Monarch and passing out potted milkweeds seeds at area events this spring as a special outreach project. We hope to extend our efforts into a 2014/2015 Chapter Focus Project. The HMN Projects Committee under the guidance of committee chair Sandy Greene began planning this year’s special Monarch outreach last fall. Betty Forrest hosted a fridge full of locally harvested common milkweed seeds all winter as a means of “vernalizing” them in preparation for spring planting. RoxAnna Theiss developed an attractive and informative instructional mini-trifold to accompany each peat pot of planted milkweed seeds for distribution. Chris Bowlen provided potting soil and expertise and hosted potting parties. Gail Napora was solicited to design and produce the artful display boards with matching table designs and t-shirts (!) for use at the event tables. Find out more about Gail and her many talents in this feature article about her on page 3 of the October 2012 issue of JMU LLI’s newsletter The Explorer. Thanks to Stephanie Gardner for her contributions to this post! Blacks Run CleanUp display table. Monarch hand painting by RoxAnna. Donations and outreach for chapter strength! Ann Murray at Staunton’s Earth Day with helpful little person wearing Monarch wings.